Prostate cancer is the most often diagnosed malignant disease in men worldwide and millions of men are diagnosed with this disease each year. It has been well identified that androgens drive prostate tumorigenesis through androgen receptor signaling. In addition to androgens, thyroid hormones have been shown to regulate transcriptional regulation of multiple cancers. Triiodothyronine (T3), a hormone synthesized in the thyroid gland, acts through the interaction with nuclear receptors and binding proteins in cytosol such as μ- crystallin (CRYM). Cytosolic NADPH-dependent 3,5,3’-triiodo-L-thyronine is one of the thyroid hormone-binding component found in the cytoplasm. In this study, we inspected the role of CRYM in prostate cancer in response to thyroid hormone metabolic action. We evaluated CRYM and thyroid hormone receptor beta (TRβ1) expression levels in a panel ofprostate cancer Tissue microarray (TMA) containing patient samples from primary and metastatic sites by histopathological analyses and immunohistochemistry (IHC). CRYM was highly expressed in normal prostate tissues but the expression continuously decreased in primary and metastatic patient samples, whereas TRβ1 expression dramatically increased during disease progression. Low CRYM expression was associated with early biochemical recurrence and poor prognosis of patients. We used human prostate cell lines derived from metastases (LNCaP, PC3, DU145, 22RV-1 and LAPC4) and from non-transformed prostate epithelium (RWPE-1) to evaluate the protein expression of CRYM and TRβ1. RNA-seq analysis was performed using LNCaP CRYM over-expression and validated by RT-PCR. Intracellular T3 hormone-binding capacity increased in cells with high expression of cytosolic thyroid hormone-binding protein CRYM. Furthermore, CRYM led to the mitochondrial membrane potential (Δψ) depolarization in PCa cells being considered to release apoptotic enzymes to induce cell death. CRYM over-expression led to suppression of androgen- regulated target genes and intracellular choline metabolism. Non-invasive F18-methyl-choline (FMC) PET/MRI imaging of PCa patients correlated with TRβ1 and negatively with CRYM levels. Therefore, [18F]fluoromethylcholine (FMC) can be viewed as a novel predictive marker for PCa active surveillance. 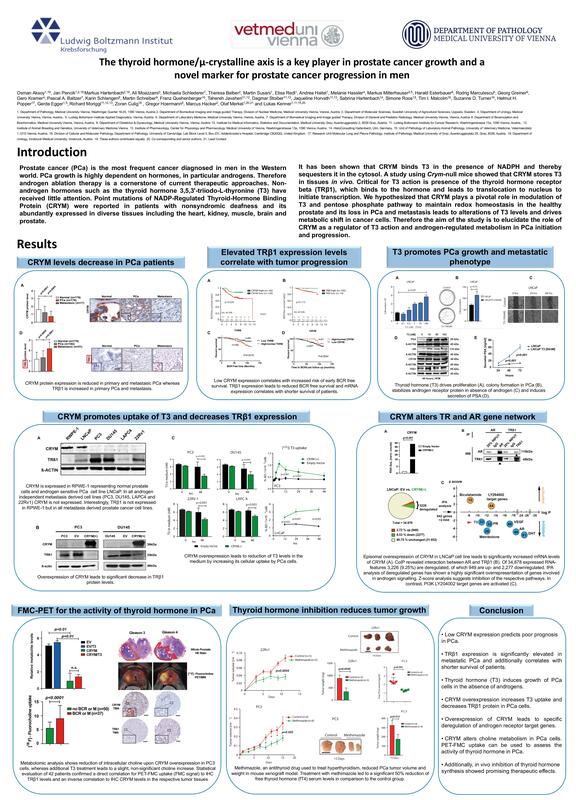 Inhibiton of thyroid hormone signaling resulted in decreasedgrowth and loss of tumor weight in xenografted PC3 in vivo. In conclusion, high expression of CRYM might inhibit the transcriptional regulatory effect of T3 by sequestering cytosolic T3 and reducing intracellular T3 levels. Thyroid hormone synthesis inhibitors might have a therapeutic relevance by deducing free T3/T4 levels that might slow down the disease progression and delay recurrence in patients with PCa.